The drug, marketed as Keytruda, is one of a new set of drugs called immunotherapy. The drug targets the programmed cell death 1 (or PD-1) receptor and allows the body’s own immune system go after the cancer cells. Merck, the maker of Keytruda, just finshed a new trial on the drug, for patients who haven’t yet been treated for advanced non-small cell lung cancer. The results are published in the New England Journal of Medicine. The 305 patients who took part in the trial were either assigned Keytruda or platinum-based chemotherapy. Progression-free survival — a clinical endpoint that basically means the cancer hasn’t grown — was a median of 10.3 months in those who received Keytruda, while those in the chemotherapy group had a median progression-free survival of 6 months. The overall survival rate at six months for those on Keytruda was 80.2%, while it was 72% for chemotherapy. “All these data taken together really represent a sea change in the treatment of the lung cancer patient,” Merck’s senior vice president of clinical development, Roy Baynes told Business Insider, referring to this trial, as well as another that looked at what happens when chemotherapy is combined with immunotherapy. This is the first randomised controlled trial to show that imunnotherapy is better than standard chemotherapy as a first treatment for people with this type of lung cancer, he said. Keytruda isn’t the only PD-1 drug trying to prove it works for this group of lung cancer patients: In August, Bristol-Myers Squibb, a company with a competing drug called Opdivo said its version of the study didn’t hit its primary endpoint of progression-free survival in patients with at least 5% PD-L1 expression in tumours (a wider net than what Merck’s was looking at). Both Opdivo (nivolumab) and Keytruda (pembrolizumab) are approved for a seemingly ever-growing list of cancer types. And they’re not cheap. Opdivo brought in $840 million in second-quarter sales alone, while Keytruda made $314 million over the same time period. “It might well be that Keytruda monotherapy in high PDL1 expressers remains the go-to regimen, representing a high bar for combination therapy to cross,” Bernstein analyst Tim Anderson said in a note Friday, before the full data was released. 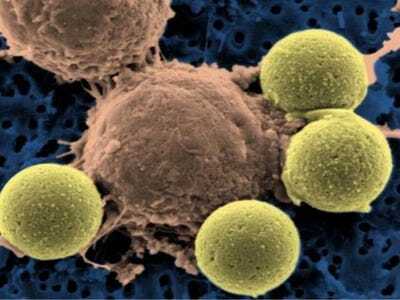 But, although there is a lot of excitement over new immunotherapies like these two, there’s still a lot that needs to be figured out about how these treatments work and who will respond to them.